The monitoring data of an e-business complaints and rights protection website have indicated that in the first half of this year, some 41,360 complaints about e-business had been reported, 45.4 percent of which concerned online shopping sites, according to a report on e-business user experience and complaint monitoring released by the China e-Business Research Center in August 2013. The website 100ec.cn received numerous complaints about e-business websites, yet still some 10,000 less compared with the same period of last year. Most of the complaints were in reference to customers’ dissatisfaction about after-sales services, followed by refund issues, false promotions, returns or replacements and internet fraud. Following are the top 10 most complained about shopping websites. 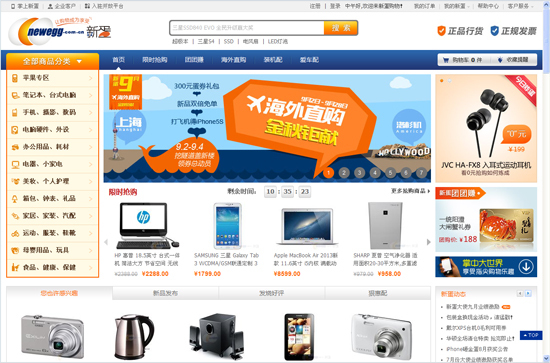 Newegg China is the Chinese branch of one of the largest online-only retailers in the U.S., Newegg.com. Entering China in 2001, the storefront Newegg.com.cn mainly sells computer hardware and software to Chinese customers. Customer complaints mainly concerned returning and exchanging difficulties. In the first half of 2013, some 41,360 e-business complaints were reported, 45.4 percent of which concerned online shopping sites.